Brunfelsia pauciflora 'compacta', Yesterday, Today, and Tomorrow. A dwarf variety of Yesterday, Today & Tomorrow growing to no more than 5'-6' on average. 1 plant simultaneously. This shrub will do well in any location between full sun to filtered light. year, except between September and November when the flowers start to develop and open. little bit on the acidic side. 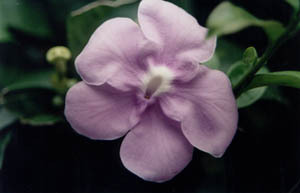 Check out Brunfelsia australis and Brunfelsia magnifica.